This planning portal offers access to the array of policies, guidelines and plans that have an influence on the type of development that may take place in the GSCID area. Developers, building control officers and land use managers look to these documents to guide their proposals and approvals of appropriate types of development in an area. It is for this reason that the vision, strategies and development of the GSCID area should be in line with these policies to facilitate integrated and co-ordinated planning. It is important for both the residents and officials living and working in the GSCID area to understand the implications of these documents so as to respond appropriately to development applications for new buildings or alterations in the area. This is in line with the new planning legislation: South Africa’s Spatial Planning and Land Use Act of 2013, the Western Cape Land Use Planning Act of 2014, and the City of Cape Town’s Municipal Planning By-law of 2015. The GSCID area is adjacent to the Claremont sub-metropolitan Node with Main Road, an identified activity route, as part of the municipal accessibility grid. Main Road is identified as an area of intended intensification with the increased construction of mixed-use buildings and a variety of land uses. The GSCID Area forms part of a Tourism Development Area that continues to Muizenburg therefore important heritage landmarks and tourism opportunities are to be highlighted, encouraged and capitalised upon. A long term (+20 years) to continually improve the transport network for the benefit of all its citizens, businesses and visitors. The GSCID Area currently has a high level of accessibility that is only set to increase and improve. Main Road is identified as a PT1 Zone where public transport is promoted and the use of private vehicles is limited. More compact development and improved financial viability of projects is possible due to lower parking requirements – also, reduced red tape for developments in PT1 and 2 zones which do not have to apply for a departure from parking regulations. The purpose is to control the appearance of boundary walls and fences and the installation of security devices on top of walls and fences in the City of Cape Town. Improved threshold between public and private spaces as increased permeability of walls improves the welcoming nature of public space and street life. This will also increase the passive surveillance from private to public space making public space safer. To provide guidance on appropriate densities and building form in different areas in the City of Cape Town to improve the city’s sustainability and to enhance the quality of the built environment through the optimal use of resources. Citywide minimum average gross base density = 25du/ha over next 20 – 30 years. Gross Density (dwelling units per hectare – du/ha) includes land used for residential and other urban purposes. Net density is where only residential land use is taken into account. The GSCID areas falls into the Main Road Activity route with a net density guideline of 100 – 375du/ha with buildings that are 4 – 15 storeys. The wide range of density and height suggested allows for a variation of density along Main Road. An Activity Route is defined as Significant and/or metro-wide to district route, characterised by strip and/or nodal urban development along sections of the route and are generally supported by a mix of land uses and higher-density urban development. Activity routes are characterised by direct access and interrupted movement flows, especially at bus and taxi stops and traffic lights. To help development proposals to take into account context and basic urban design considerations. To aid in the improved conceptualisation of development proposals, particularly when measured against the impact these developments have on the public domain. 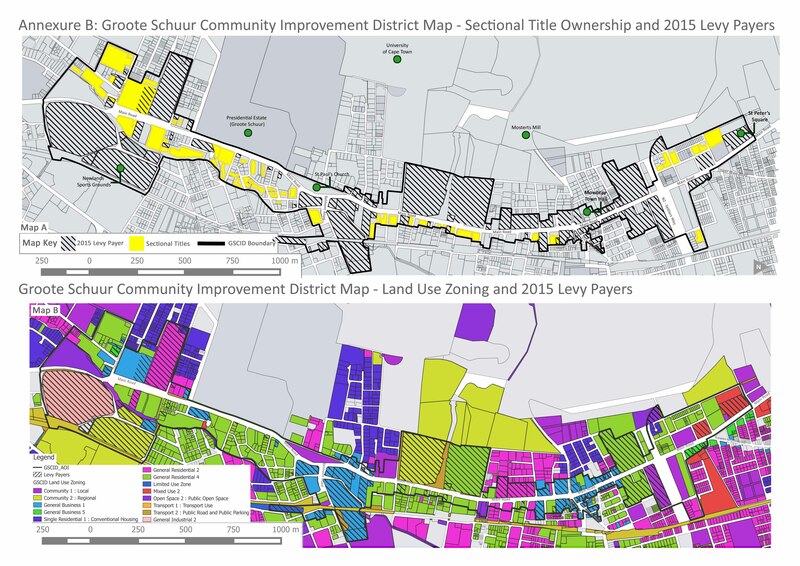 This documents provides generalised urban design principles to be applied appropriately within the GSCID area along with other areas around Cape Town. What is Urban Design: It is the collaborative and multi-disciplinary process of shaping the physical setting for life in cities, towns and villages; the art of making places; design in an urban context. Urban design involves the design of buildings, groups of buildings, spaces and landscapes, and the establishment of frameworks and processes that facilitate successful development. (Urban Design Group UK, 2011). Ensure that spatial connections are created and enhanced by acknowledging the generators of movement within a district or public space with the inclusion of NMT as a primary element. Heritage character and cultural landscapes are to be respected and enhanced (both natural and built). The GSCID area is located in sub-district 3 of the Southern District – Mowbray to Muizenberg. Mowbray is understood to be a District Node with Rondebosch as a Local Node. The area will continue to develop on the basis of a strong urban structure and reinforcement of the development corridor. Area will continue to sub-areas with very differing characteristics (low to high density) that enable the development of areas of distinct characteristics. More intense development to be guided towards nodes along Main Road with emphasis on densification within 500m and within 1km of nodes. Existing nodes are to be supported and reinforced with new nodes outside of these areas to be discouraged. A reduction in impervious surface area on sites within the Liesbeek River Catchment Area. To outline a process for assessing and identifying design requirements for new buildings and to provide specific design-related guidelines for new developments in proposed and declared heritage areas. 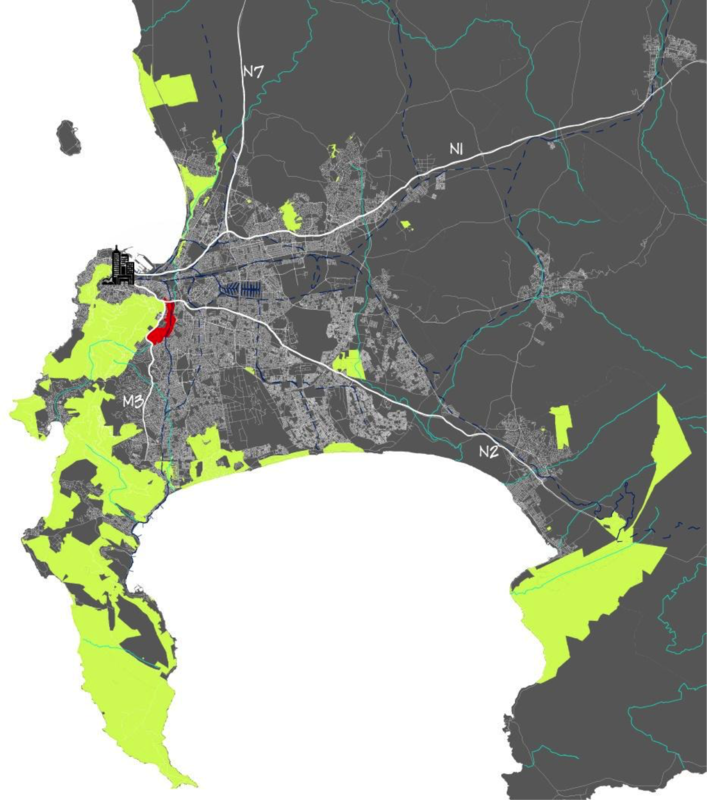 The GSCID area abuts and includes Heritage Overlay Zones as indicated in the City of Cape Town Zoning Scheme. These are identified for their significant heritage value with consideration of this heritage to be taken account when undertaking new developments or alterations to existing buildings. Materials (roof sheeting, timber, face brick, stone). Architectural features, details, patterns and styles: roofs, eave lines, facades, windows, dormer windows, stoeps, balustrades, low boundary walls, repeating colonnades. Spatial delineators especially on the street facade (terraced slopes, social front stoeps, set back garages). Orientation: older buildings tend to be more open towards the street and sensitive to climatic requirements. Vegetation: tree lines, avenues and vegetation types. Scale: to fit in with the general size and bulk of surrounding buildings (additions should be less dominant than the main building). Entrances and access: street frontages that were designed to be the front entrance should remain the front entrance of new developments and refurbishments. Providing off street parking in front of a building can be detrimental to the relationship between pedestrians and the building along with ruining the overall character of the street. Security features: fences, gates and burglar bars (preferably placed internally and designed to suit the character of the house). Description of Document: To make a positive impact on the city, the focus needs to shift away from the negative aspects of crime prevention, towards improving levels of safety more generally. This guideline document focuses on situational crime prevention, and recognises the positive role that spatial planning and design can play in creating safe environments, where crime and the perceptions of crime are reduced. Improved surveillance and visibility – increasing levels of awareness by promoting passive surveillance and the active use of the public realm to increase the number of “eyes on the street”. Safe access and movement – providing a safe and integrated network of movement routes, linking key destinations. Positive relationships and layered spaces – creating positive interfaces between buildings and the public realm, a comfortable transition between public and private space, and designing buildings and spaces to make them more robust and resilient against crime and buildings, so that they identify with and take responsibility for their environment. A positive image – addressing perceptions and guarding against environmental decay. Positive relationships and layered spaces – creating positive interfaces between buildings and the public realm, a comfortable transition between public and private space, and designing buildings and spaces to make them more robust and resilient against crime. Improvement of neighbourhoods and increased perceptions of safety over time.